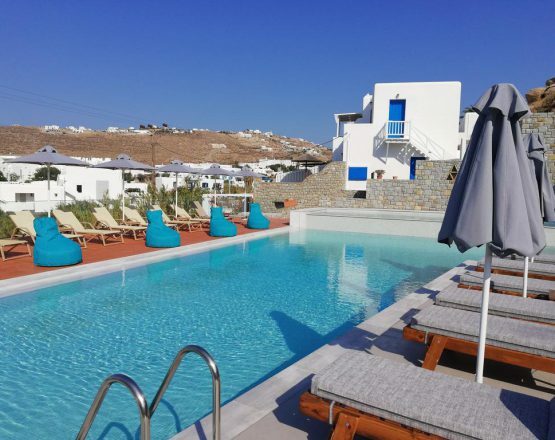 If Mykonos Island is your holiday choice, selecting accommodation close to the beach will without a doubt make for a very enjoyable and memorable experience. Pelagos Studios, situated at Plati Gialos, one of Mykonos’ most popular beaches is just that kind of place. Recently built, these clean and well managed studios will provide comfortable accommodation and a friendly atmosphere while fulfilling your vacation needs. The Pelagos Studios’ construction is designed in three levels with the top two floors fronting on to large balcony terraces with a sea view. All levels have outdoor seating areas from which to enjoy drinks or a meal. The studios come complete with equipped kitchenettes and an indoor eating area, private bathrooms with shower on bottom floor and bath tub/shower. Everything about this property is perfect, the rooms are clean very clean the location could not be any better! In less than 100 steps you will be on the beach where there are bars and restaurants on the sea front for lunch etc sun chair I could ask for more also the pool was really good too will definitely be booking again next time I come to visit! Everything was perfect! Great place, good location and yianni the owner was amazing! Will definitely go back!! Love it and would highly recommend it! Evonne Gabrilis, Very clean, the pool was beautiful! Everything! The staff was amazing and friendly, the new pool waa great, walking distance from a beautiful beach, great restaurants in the area. Would recommend to anyone going to Mykonos!I would really have to try to think of something bad to say about this place, they were too good. Dimitra and Giannis take good care of their guests and the hotel is super well maintained. We enjoyed our stay and would definitely go back. Everything was wonderful. The studios are right in the front of the beach, with an amazing view to the sea. There are many nice restaurants around and beautiful beaches within a walking distance, and a mini market downstairs with great products. You can get to the town center in 10 min by bus. Our room was super clean and it had everything we needed. The host was very friendly and helpful and it gave us all the tips and info we needed. We absolutely loved our time there and we will definitely come back! Everything was absolutely perfect ! The pool was beautiful and generally quiet during the day. We had a large and comfortable room with basic kitchenette. Just a minute walk from the beach. Our host was extremely helpful with any questions we had too. Perfect location! Friendly helpful owners. Clean rooms. Stunning pool! Will be back. 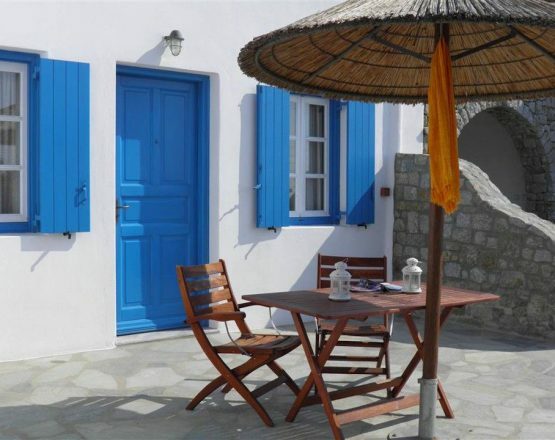 Platis Gialos is a coastal village with many tourist accommodations. 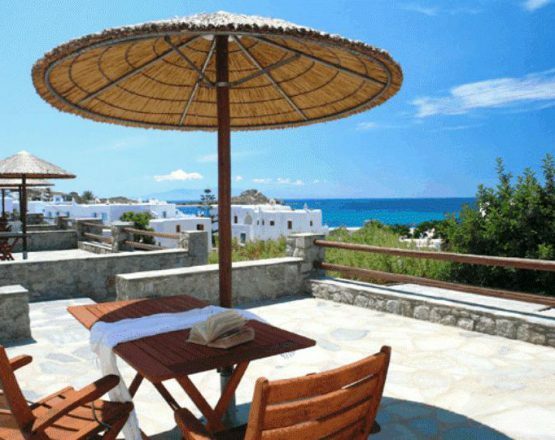 Located on the south side of the island, just 3.5 km from Mykonos Town. The beach of Platis Gialos (the longest beach on the island), with the endless golden shore and plenty of facilities attracts lovers of water sports such as water ski or jet ski that are available here. Platis Gialos beach is also great for swimming, sunbathing, boating, fishing, and many more aquatic activities.